Former vice president Al Gore laid down a green gauntlet Thursday, challenging the nation to produce all our electricity from renewable sources, such as wind mills and solar panels - and do it within a decade. In Washington CBS News anchor Katie Couric spoke one-on-one with Gore, whose environmental work earned him a Nobel Prize. What follows is a full transcript of the interview. Couric: All right, Vice-President Gore, let me just ask you about this challenge you've put forth today. And to briefly explain what prompted you to do this, why? Gore: We've got to end our dependence on oil and coal. They're rising rapidly in price. That's why gasoline prices are going up, and that's why electricity rates are going up. But the new demand for oil and coal from China and these other fast-growing countries means that the only way we're going to escape the rising prices, and the dependence on foreign sources is by switching to renewable sources. And now that … the coal and oil's gone up so high and the engineers have brought down the cost of solar and wind and geothermal. Now it's competitive. And if we make a big commitment to take all of our electricity over to renewable sources, then the cost will come down more quickly. We'll have less pollution, lower cost … and a better national security guarantee. Couric: Don't we get a lot of our electricity from natural gas as well? Gore: Well, some. Most of it comes from coal. Some of it from nuclear, from hydro. A lot of it, some from natural gas and some of the new units built in the last few years have come from natural gas. Natural gas … is a little bit cleaner than oil and much cleaner than coal. But we, over the, and this is a transition fuel. But in the longer-term, we really should switch to solar … and geo-thermal and wind energy. Couric: Do you think clean coal is an oxymoron? Gore: There's no such thing as clean coal. It's non-existent. Theoretically, it might be possible, many years from now, to come up with a way to clean it as it's burnt. But there's not a single demonstration project in the United States. They're not doing anything … to put substance … to the slogan, "clean coal." Clean coal doesn't exist. Couric: Doesn't it take as much energy to produce it as it would to burn coal? I mean, isn't that the argument against it, the whole process is, I mean, we're not gonna get into great detail here. But, is, that's my understanding, anyway. Gore: One of the reasons they have been slow to install these systems for capturing the CO2 when the coal is burnt is that it's expensive. But with more work and some point in the future, after that work is done, it may be possible. But the burden should be on those who are burning it to show that it can be clean. It's not now. And just to say it's clean, that's deceptive. Couric: You've set a 10-year deadline. Is that realistic? Gore: I think it is, because there's some challenges - think of the Apollo program, the interstate highway system - there's some challenges that are really important to the future of the country, that can't be done in a single year or two years. But setting a 40-year goal, that's, you know, nobody takes that seriously. Ten years is about the limit of what we can stay focused on and … can sustain a really sizeable national commitment. An awful lot's at stake, Katie, because the scientists are telling us that we have less than 10 years to begin massive reductions in global warming solutions, or else this climate crisis might not be retrievable. It is retrievable and solvable, if we start now on a bold program. Couric: You talk about solar farms in the desert, wind farms in the plains, a totally new electrical grid will have to be built. Your own group says, Vice President Gore, it will cost between $1.5 and $3 trillion. Couric: That's a lot of money, no matter how you cut it, right? Gore: It is. It's almost as much as the cost of the Iraq War. And it's almost as much as we would have to pay to go out and build new coal plants and new oil-drilling rigs in order … to get the energies that way. We're going to make investments in new energy supply. If we choose to do it with renewable energy, it will cost money. But once we built it, the fuel is free. The sunshine and the wind … are here. China can't bid up the price. It's not gonna run out. So we need to switch to a new system that doesn't pollute, that won't be disrupted by some war in the Persian Gulf, and that will steadily come down in price as we make a bigger commitment to it. Couric: Do you think the political will is there to change the way we do business so dramatically in this country? Gore: I think we're getting there. I don't think it's there on Capitol Hill. I don't think it's there in the White House. I think it's beginning to build pretty steadily among the American people. People are really hurt by these high gasoline prices. And people have caught on, after 35 years, to the fact that simply producing more oil does not bring down the price of gasoline. Hasn't in the past, won't in the future, because these new growing economies in China and elsewhere … are bidding up the price of oil, and so gasoline prices … we've got to break free of this limited supply of dirty fuels. And shift over to a source of energy that's based on fuel that's free. And equipment that's high technology and is steadily coming down in price. Couric: What about nuclear power? I ask, what about nuclear power, because countries like France get something like 75-to-80 percent of their power from nuclear. Gore: France is unique. It's a special case. We have a lot of nuclear plants in the U.S., and … I'm not anti-nuclear. I'm a little skeptical that's it's gonna play a much bigger role than it does now. I think it'll continue to play a role. But the problems with nuclear are it's very expensive. It takes a long time to build. And these nuclear plants only come in one size, extra large. And utilities don't want to commit all that money for 15 years to get a plant that's rising in cost. And of course the fuel also has some problems, because if it gets out to other countries that can't be trusted, it feeds the problem of proliferating nuclear weapons. Couric: Do you also worry about nuclear plants being potential targets for terrorists? Yes, I myself, I don't think of that as a bar to nuclear power, because there are a lot of things that are potential targets, and we need to equip ourselves … to protect them. It's one of the problems, for sure, the nuclear waste storage issue is one of the problems. But I think the bigger problems are the cost, the long time for construction, and also the problem that if other countries make a massive commitment to it, we make the problem of nuclear weapons proliferation worse. Let's talk about T. Boone Pickens. I recently talked to T. Boone about his whole idea of wind power, along this wind corridor, in the central part of the United States. What do you think of that? Gore: He's obviously a very smart guy. He's been very successful. And I'm impressed that, after such a long and successful career in the oil business … he's done the numbers and figured out that huge investments in windmills are gonna make him money and help the country. So I think that he has a lot of credibility. When he says, "We can't drill our way out of this," he knows what he's talking about, and that we should go to renewable sources. Couric: What do you think of his notion … replace the electricity we get from natural gas with wind power, use that natural gas to power automobiles. Gore: Yeah. Some people see that as kind of a shell game. I think it's a respectable idea. I would prefer to take our cars and trucks and move directly to electric vehicles, and not take the intermediate step of trying to equip them to use natural gas. But … he has the same basic idea of shifting away from oil and coal, not better overly heavy on nuclear, but instead making massive investments in renewable energy. That's the keystone of his plan. Andy Grove at Intel has a similar plan. So a lot of our senior business leaders are telling us, these are not normal times. We cannot continue to bring in 70 percent of all of our oil from overseas, and keep seeing the price … and keep doing it while the price goes up and up. Couric: Which must be gratifying for you, to have these Republican business leaders saying, you know, "we want to jump on this bandwagon. We have to." Gore: Well, yes. I've long argued… that this should not be a partisan issue. And I'm gratified that a lot of people, regardless of political party, are looking at the facts and saying, "Yes, it's time to move in a big way." And the reason I put out this strategic goal of shifting all of our electricity generation over a 10-year period to renewable sources, and if they can capture and safely store the carbon from fossil fuels, that can be a part of it. But we can't count on that. We need … to shift over to renewable energy. Couric: You know, I don't remember exactly all the factors, but some critics say, you know, solar and wind is the not the panacea some people think. It's very expensive. Usually in the summer months, there's less wind, when people need more electricity. I sort of read some reality check on these alternative energy sources. Do you think you're putting too much stock in these, as a panacea for our energy problem? Gore: Not at all, because the older conception about solar power and wind power are giving way to the new developments that these scientists … and engineers have come up with, because the price of oil and coal have been going up so much, there have been, there's been a lot of investment in getting better ways to convert solar energy into electricity and wind into electricity. That cost has been coming down, while the oil and coal has continued to go up. It's now right at the point where it's competitive. And it's true that wind power comes and goes with the wind. But the solar plan, that are in the desert areas where the sun's almost always shining, they're pretty steady. And the production actually matches … the times of day when we need the most electricity. And the steadiness of that solar power can even out the peaks and valleys of the wind. And if you do 'em both together, they fit like a hand in a glove. Couric: I wanted to ask you about President Bush's press conference this week. It was interesting. Someone asked him, "Do you think Americans should sacrifice more?" He, in his press conference this week, President Bush said it would be presumptuous for him to ask the American people to sacrifice more to deal with this current, gas prices, et cetera. Do you think it's presumptuous to ask the American people to conserve? Gore :Well, I have to warn you that I've recently begun to fear I'm losing my objectivity on President Bush. Gore: So I'm gonna …you have to take it with a grain of salt. Couric: We'll leave him out on the cutting room floor, but no. I was just curious. I thought it was such an interesting thing, to not kind of take that opportunity, when he's having a news conference, to say, you know, we all need to, you know, call sort of for the national consciousness … to get it together and to be aware of this, and mindful … of their consumption. Gore: I think that the American people are willing to take a clear view of what our future requires. And now with these gasoline prices continuing to go up, electricity rates climbing rapidly, they know that the oil and coal are not gonna come back down in price. They're gonna continue to get more expensive. And the new efficiency and improvements … that have been made in solar and wind are making them much more attractive. It is time now to make a national commitment, to switch over to these renewable systems, and then we can break free of the rising prices … from carbon fuels, oil and coal, and we can break free from our dependence on foreign sources like the Persian Gulf. Couric: It really is multi-tiered, isn't it? It's a national security issue. It's an environmental issue. Couric: I mean, it really covers the gamut. Gore: One of the reasons why our country's had such a hard time dealing with this, is it does involve national security, energy, the economy and the environment. But there's a common thread that runs through all of them. The key is ending our dependence on carbon-based fuel. And if we grab hold of that thread and pull it, the other problems begin to unravel, and we got the answer right in our hands. It's the switch over from carbon-based fuel to renewable energy. Couric: Let me ask you about, a couple quick political questions, 'cause I know you're on a tight schedule. John McCain is much more moderate on climate change than President Bush. He talks about limiting emission. He does talk about clean coal. He accepts global warming, says it exists. If elected, do you think he would keep his clean stripes? Couric: Let me just ask you it this way. Are you impressed, Vice President Gore, by Sen. McCain's commitment to the environment? Gore: I think he deserves credit for having taken leadership position in years past, at a time when it was hard for people in his party to do that. I have to balance that with the expression of a little concern that in, during this recent campaign … he has seemed to move a little bit toward President Bush. But I give him credit. Having made those early statements and having come up with the policies he used to advocate, he's got to have something in there that tells him what the right thing to do is there. I try to work with him. Also Sen. Obama, who … says the right things and has put out a really forward-looking plan on this. So … both of them are way ahead of the current administration. Couric: John McCain supports lifting the ban on offshore oil drilling. Why, what's wrong with that? Why are you opposed to offshore oil drilling, if … it can be done in a safe, efficient way? Gore: Well, that's a big "if." There are areas off California, just to take that example, where there are huge amounts of money at stake … with the use of the coastline. And they've had disasters out there with … offshore oil drilling. Couric: In 1969 there was a big one. Couric: But that was quite a long time ago. Hasn't the technology improved? Gore: Maybe it has, but I think the state of California has the right to protect its coastline. But there's another issue involved. They've already got all these leases with … that they're not producing now. And the ones they're debating today would never be produced until 10 years from now. So to say that is a solution to gasoline prices … is very misleading. And remember this. It's very easy to take that oil and just send it west over to China. The value of the dollar has been going down. The Chinese have been bidding up the price of oil, and they've been buying supplies that we used to get. So if the oil companies 10 years from now, produce a little bit of extra oil out there, at the risk to the … coastlines, and then sell it to China, are we any better off? I don't think so. And that costs money. I believe that we ought to invest, instead, in renewable sources of energy, and abandon the pretense that just trying to get a little more oil is going to solve the problem of our dependence on oil. Couric: …even if oil … is found. Why do you believe Barack Obama is better than John McCain on climate change? 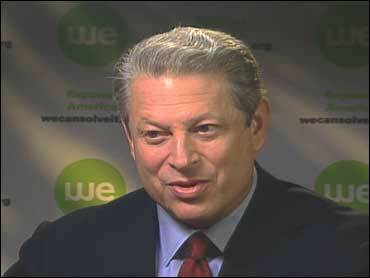 Gore: Well, his proposals … are clearly different. And much more far-reaching. You just line up the proposals side by side. It's really a stark contrast. And he's proposing to do much more, much more rapidly. Now of course, I would like to see more still. And I do give credit to Sen. McCain for having taken the positions he's taken. But if you're asking the question, which one is better on this issue? Clearly Sen. Obama is. Couric: Sen. Obama said during the primaries season, there would be a place at the table for Al Gore, in an Obama administration. Gore: Well, that's a very nice thing for anybody to say … and I appreciate it. I would not take a formal position in any administration. My, I see my role as trying to change the public opinion, out here in, with the American people, to create a basis of support that will sustain whoever is president, in making bold, taking bold steps to solve the climate crisis. Couric: So you can't see yourself being, say, an environmental czar, helping to shape environmental policy or energy policy in a new administration? Gore: Well, it's a really nice idea. I don't think that's the best way for me to serve my country. I think the real solutions to this climate crisis must involve a sea change in public opinion. So that when the American people demand solutions, the elected officials and politicians in all parties will then respond. That's what I'm trying to do. Couric: What about the VP slot? Couric: Come on, help me make some news here. Gore: I have many times said, you know, I have a personal term limit. Only two terms as VP. Couric: So if he called you and said, "Al, buddy, listen. I really, really, really need you." Gore: Well, I repeat. I've imposed a personal term limit of two terms as VP. Couric: So absolutely nothing could get you to jump on board. Couric: No, okay. Really quickly about the election, do you think that we're in a position to not have a repeat of Florida, in the 2008 presidential election? Gore: (laughter) I certainly hope so. Couric: But do you think … that things are in place? That the balloting has been improved? Gore: I don't know. I don't know. I don't consider myself an expert on what changes have been made there in state law. I read articles from time to time. But I really don't know … what's been done there. Couric: You don't think we're gonna see the guy with the bulging eyes, staring at the hanging chad again? Gore: (laughter) I hope not. Couric: Sen.Obama is about to embark on a trip to the Middle East. If you could give him any advice, what would it be? Gore: Well, I would advise him to do what he's doing, to go and listen and learn and find out what the latest facts are. I'm impressed with his command … of these issues, and I'm impressed that he has taken the initiative to go and see for himself and learn more.